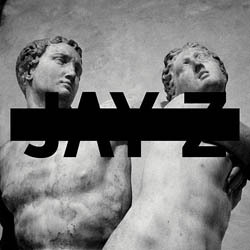 Magna Carta… Holy Grail is ridden by ghosts of Jay-Z’s glorious past. The title itself seems to allude to his Twitter proclamation of “#newrules” for the music industry: Debuting the album via a Samsung application, and negotiating a sale with the technology company for a million free digital downloads to its customers. This isn’t the first time he’s employed unusual promotional gimmicks. One of his best occurred during 2003’s The Black Album when he summarily announced his retirement, and although he obviously had no plans of making it permanent, his fans ate up the conceit, hailing him as the best rapper ever while waiting anxiously for his return. Now, he wants us to place the Magna Carta… Holy Grail experience among his watermarks. Whether Magna Carta Holy Grail is a document of historic significance or an elaborate branding exercise for one of the richest men in the music industry is a topic of fierce debate. Some of the attacks seem dubious. Jay-Z’s seemingly pretentious use of an ellipsis in Magna Carta… Holy Grail hearkens to 1998’s Vol. 2… Hard Knock Life. He has made a career from gloating about his money, his women (and now, his wife Beyoncé), and his toys, and he continues the tradition on “Picasso Baby.” “I want a Rothko/ No, I want a brothel/ No, I want a wife that fucks me like a prostitute,” he says. “Jeff Koons balloons, I just wanna blow up.” These name drops are less about communicating a deep understanding of those visual artists’ iconoclastic work than assuming the status that comes with buying them at a Christie’s auction. The overwrought symbolism of “Somewhere in America,” “Oceans” and “Heaven” has been present in his work ever since “D’evils” from Reasonable Doubt. If some listeners have grown weary of Jay-Z’s tics as he nears the end of two decades as a rap star, then they should re-evaluate their formerly ardent embrace of them. Magna Carta… Holy Grail reunites Jay-Z with men who have served him well. There is Timbaland, who helped make “Big Pimpin,” “Dirt on Your Shoulder” and other hits; Pharrell Williams, who as part of the Neptunes was responsible for “Change Clothes”; and Hit-Boy, who made the beat for “Niggas in Paris.” Amazingly, there is also the teenage neophyte WondaGurl, who collaborates on “Crown” with Texas producer Travi$ Scott. Her appearance marks the first time in recent memory that a woman has landed a production credit on a major hip-hop album, with Missy Elliott’s work on her own albums as the last precedent. Despite the comfort of working in familiar surroundings, Jay-Z’s flows often sound choppy and unprocessed. He often resorts to a halting, declamatory voice, as if he’s shouting a sentence from a script and then pausing for effect. Even when he presents a strong concept such as “Holy Grail,” a meditation on “sipping from the cup” of success, he works an ungainly vocal rhythm, from slipping into an ill-advised bounce flow to nearly going off-beat altogether. It’s a surprising but not entirely unexpected result for a man whose smooth and seemingly unwritten flow of words was once peerless, and only rivaled by legends like Rakim. One of these days, some enterprising blogger will write a scientific analysis on why some rappers’ skills degenerate like old athletes, while others deepen and appreciate like fine wine. For Jay-Z, the difference isn’t his 43 years of age. He sounded great only two years ago on Watch the Throne as he combated perceptions of himself as a luxury-rap plutocrat. That album was executive-produced by Kanye West’s team, and they teased a more vibrant and assured performance from Jay than the one on Magna Carta… Holy Grail. Given his string of disappointing albeit commercially successful solo albums dating back to 2006’s Kingdom Come, an artistic losing streak briefly interrupted by 2007’s underrated American Gangster, one could conclude that he needs a strong conceptualist like West to help maintain focus. Here, he seems distracted. He touts his Roc Nation ventures as a sign of his power, crowing on “Crown,” “Scott Boras, you over baby/ Robinson Cano, you coming with me!” He deployed these kinds of devices before – remember when he bragged about his ghostwriting hustle when he rapped “For the right price, I can even make your sh*t tighter” on “Ride or Die” from Vol. 2… Hard Knock Life? But now, they only confirm that his mind is partially elsewhere. When he touts his cultural impact in a mocking voice, “They see I’m still putting work in/’Cause somewhere in America/Miley Cyrus is still twerking,” and apparently refers to Miley Cyrus’ “We Can’t Stop,” it suggests that he finished the album mere weeks before its July 3 Samsung release. There are worse signs that he took little time to refine Magna Carta… Holy Grail’s contents. The music for “F.U.T.W.” and “Oceans” sounds like promising instrumental loops in need of further development. Rick Ross’ cameo on “FuckwithmeyouknowIgotit” seems slapdash, and so does Frank Ocean’s chorus on “Oceans.” The interludes “Beach is Better” and “Versus” sound clumsy and ill-conceived. So why is Magna Carta… Holy Grail generating such repulsion in some fans, a reaction that this uneven yet intermittently interesting album doesn’t deserve? KRS-One once remarked on BDP’s “My Philosophy” how we often hate our kings out of pure spite even as we anoint them: “If you were to rule or govern a certain industry/ All inside this room right now would be in misery.” It’s a contradiction that has riddled Jay-Z ever since the rap world effectively anointed him the living G.O.A.T. ten years ago, and why he now suffers through horrific reviews even as Magna Carta… Holy Grail turns into a best-seller. He wants to sustain that Black Album moment when we declared our loyalty to him, but it has long since passed.